SO MUCH YARN, SO LITTLE TIME! : Baby Bootie-licious! What does a knitter do when they have a baby shower on the weekend? Pick up those needles and knit something for a baby! I love knitting for babies...what knitter doesn't? The projects are small and finish quickly...quite satisfying. The baby patterns out there are just so gorgeous...I started knitting all because of Debbie Bliss' baby patterns. 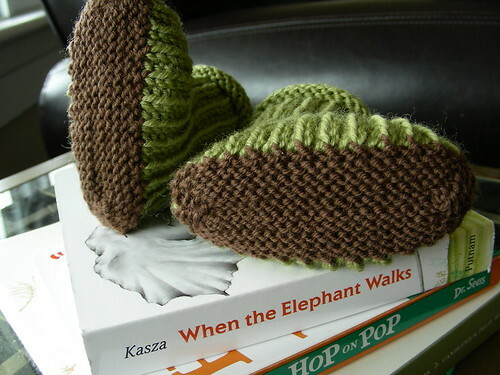 So, I came across the cutest baby booties on Ravelry. Yarn: Elann Devon in green and brown. This is listed as a sport weight, but I consider 4 ply. It is currently not available. Adjustments: All I did was knit the sole in brown and the main part of the bootie in light green. The contruction is brilliant. You start with a magic cast on. I purled the first row...ensuring the second set of stitches were worked through the back of the loop to put them on correctly. I did my increases on the knit rounds of the garter stitch sole. The increases are done at the toe and the heel...mine look ok but I would like to figure out a better increase for garter stitch. I switched to the green once I started the brioche stitch. It looks great and it is so squishy. This baby is going to love these on his feet! The pattern is simple to knit...I actually knit the second one with out the pattern. I have bits of Devon left...more booties to come...just need some babies to knit for! I will knit for my baby on the way for sure! Thanks for inspiring! That's the best looking, cutest booties I've ever seen! Thanks for sharing. Very cute! Thanks for the link. Must go queue them now. Those are indeed adorable. I'll have to keep the pattern in mind for shower gifts. Perfect timing and simply cute! Love them! Now I know what to look for the next time someone I know is expecting. You did such a fantastic job! I'm totally stealing that title if I ever need to post about baby booties. Awesome! Are you for hire? I have about 1,000 babies coming in the next few months! 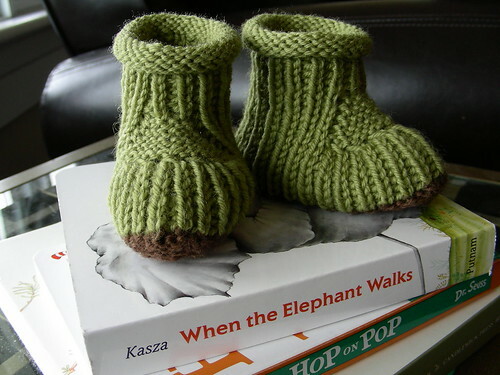 I need these booties for Gianni and Judy's baby!!! OK, those are so. darn. CUTE! Adorable booties! I have lots of younger relatives who should be settling down and having families some time soon (well, in the next few years anyway) - these will be a great little gift.